The tropical Pacific, like other tropical ocean regions, contains warm, clear water. The water is clear due to the absence of plankton and suspended particles. Plankton is the base of the food web in all oceans and, because there is little plankton in the tropics, tropical ocean water is nearly sterile in comparison with the fertile waters of the temperate oceans. This is in contrast to the popular misconception that tropical ocean regions are very high in biological productivity. In order for life to flourish in the harsh conditions of the nutrient-poor tropical seas, the creatures of the seas have evolved many methods to capture food. "Beneath The South Pacific" shows the importance of the reef community and introduces viewers to many of the great number of unique and fascinating creatures which live around the reefs and sand flats of the tropical Pacific. 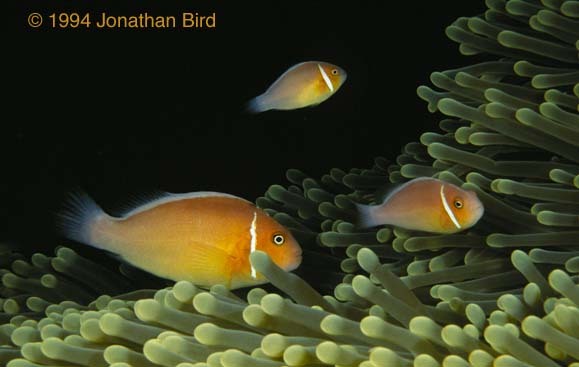 Three Pink Anemonefishes swim among the tentacles of their host anemone, safe from danger.